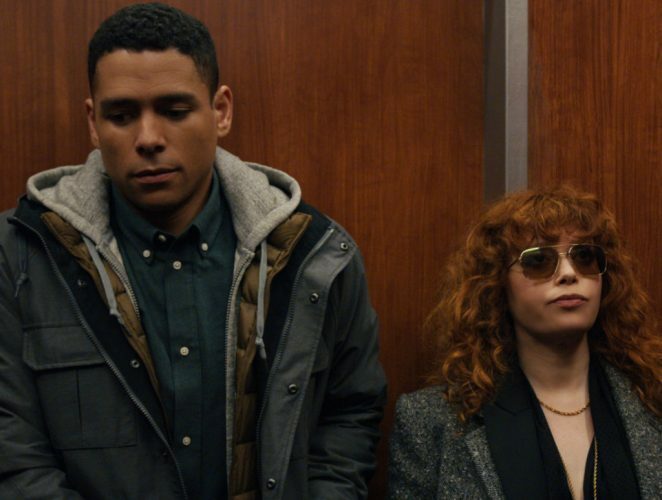 Netflix’s latest treat has come in the form of the comedy, ‘Russian Doll’, that effortlessly breaks away from any preconceived notions that you might have about it. 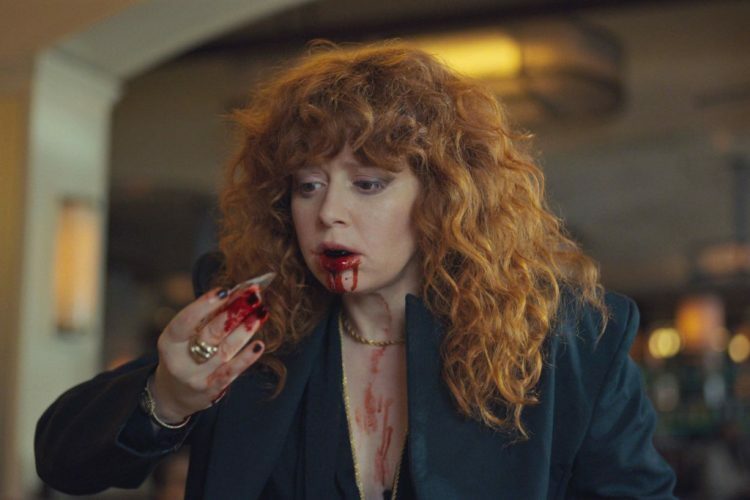 By now, we have seen a lot of stories that have used the premise of time loops, but none of them had the character arcs and the thematic discussion that ‘Russian Doll’ so expertly touches upon. Its comedy is subtle, acting is top-notch, and the impact is profound. Like a matryoshka, it seamlessly covers up the heavy themes with its attractive casing. If you haven’t yet seen the show, I’d advise you to come back to this article later, because here, we’re going to break through all the layers. 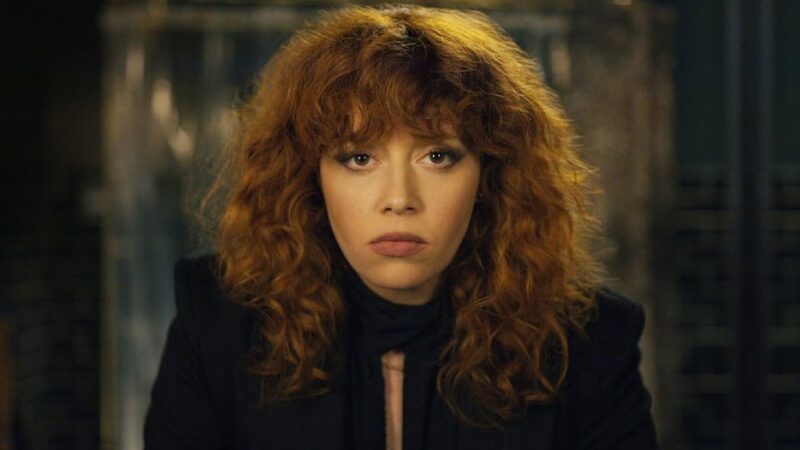 Nadia Vulvokov (Natasha Lyonne) is a software engineer who is in the business of designing games. It is her 36th birthday, and her friend, Maxine, has thrown a wild party for her. There is drinking, dancing, a bit of cocaine wrapped in a joint, and an encounter with a stranger. Everything goes well until Nadia dies. For a normal person, it would have been the end. But, for Nadia, things are just getting started. Because in the very next moment, she finds herself back at the party. Confused and irritated, it takes a couple more dying sessions for Nadia to grasp the idea that she is caught up in a time loop and that there is no escape from it. And then, in just another repetition of the events, her path crosses with that of Alan’s. She learns that he, too, has been reliving the same night over and over again, though his life is quite different from hers. 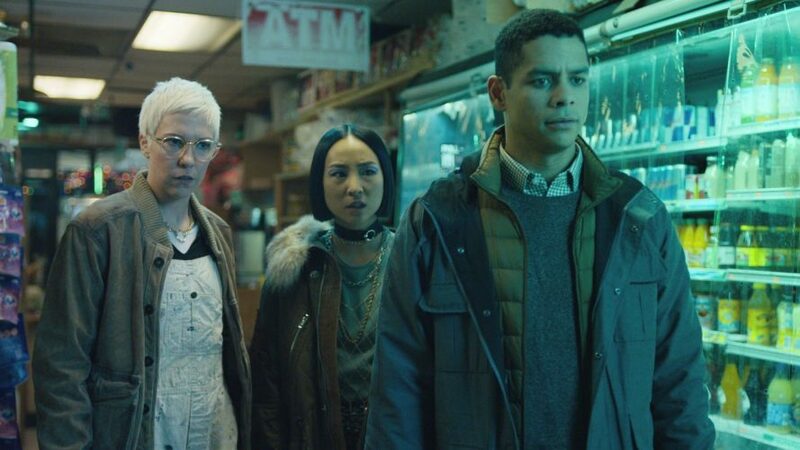 Considering that they are the only ones stuck in the loop, they unearth connections between themselves, in the hope of finding a way out. For three episodes, we are kept under the impression that it is explicitly Nadia’s story. 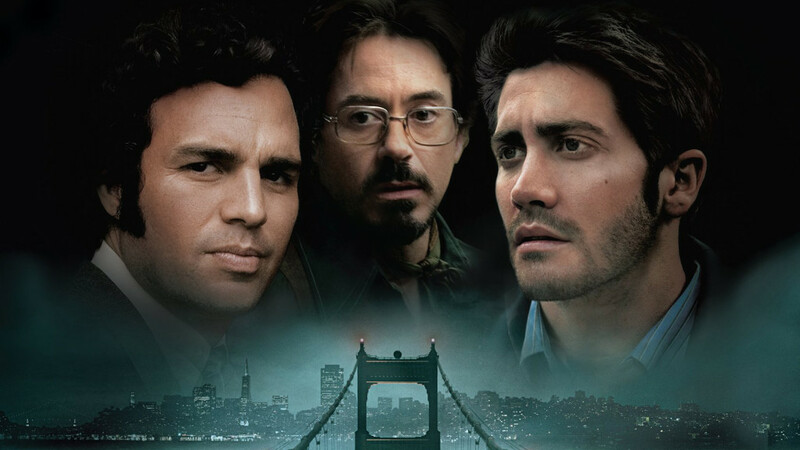 As we’ve often seen in other films, time loops are, generally, focused on a single character. 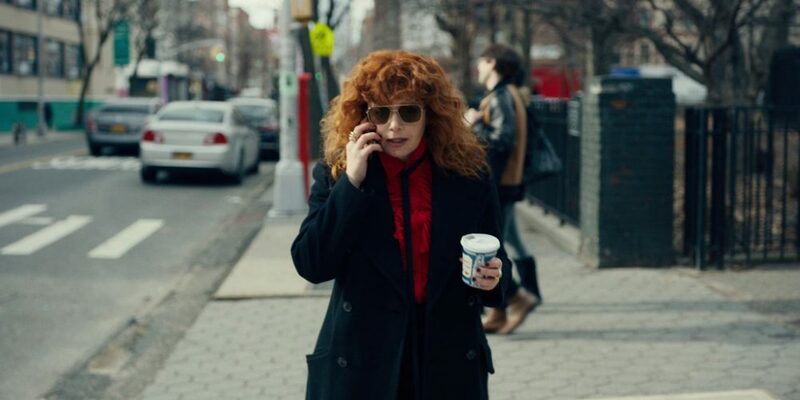 For a while, ‘Russian Doll’ maintains the same façade. However, by the end of the third episode, the show actually begins to fulfil the meaning of its name and splits into half to reveal another story nested within it- Alan’s. Even though their fates seem strongly connected to each other, Nadia and Alan are the representations of two very different kinds of people. Nadia is a cynic who doesn’t bother herself with making strong connections with anyone. She has seen some difficult times in her life, and these experiences have ingrained some harshness inside her which often comes out in the form of sarcasm. However, she also ends up hurting the emotions of people who really care about her. Maxine and Lizzie are her closest friends, but even they have faced her difficult side. For instance, Nadia’s comments on Lizzie’s endeavours discourage her from taking significant decisions in her life. She doesn’t adopt those mastiff puppies, and doesn’t get married to Gina! John, Nadia’s ex, is clearly in love with her and, in every loop, he tries his best to make things work with her. But she had let him down before and she continues with it until Alan shows her the error of her ways. She lives a lonely life, often preferring the company of Oatmeal, her cat, over others. Even though Ruth, her sort-of-godmother, is a therapist, Nadia hasn’t overcome the issues from her past. She still harbours the guilt over abandoning her mom and tries to make up for it by letting her hair flow naturally, as her mother wanted them. The locket that she wears around her neck has more sentimental value to her, even when it has a lot of monetary value. Her thought process reflects in her work as well. As Alan complains, she has designed a video game where the heroine has to solve everything on her own, without any help. She has been doing something similar in her life. Nadia gets stuck in the time loop on her 36th birthday because, somewhere in her heart, she feels responsible for the death of her mother, and feels guilty for the fact that, now, she is older than her mother had ever been. (The number 36 also has some relevance in Judaism and considering that there were some other Jewish connections to the story, it wouldn’t be a surprise if there is more significance to the number than just the age of her mother.) The influence of her mother forms a very strong theme of the show, so much so that the show seems to have been named after this theme. Matryoshkas, or a ‘Russian Doll’, is the symbol of (among other things) a mother’s connection with her child. While we get a clear picture of Nadia’s past and come to know about the roots of her problems, Alan’s issues remain rather obscure to us. His past and the event that became the basis of his current problem is never fully revealed to us. In this sense, we never really reach the centre of Alan’s matryoshka of issues. However, we do get a very clear idea about the kind of person that he is. Something in his past had planted the feeling of inferiority complex in Alan’s head, and this led him on a quest to fix everything, to be perfect. The way he packs everything perfectly for his vacation, the systematic arrangement in his wardrobe, adjusting the pillow, obsessing over keeping the place clean- he clearly has an OCD, and he is also a control freak. The loop actually becomes a good thing for him because he knows everything beforehand and so, he can control everything. But, when new information comes to light, he loses his balance and blames this routine-break on Nadia, who, unlike him, lives in a messy place and couldn’t care less about the ashes of her cigarette ruining someone’s kitchen counter. For her, the only good thing about the loop is that it will reset any and all littering. So how was it that two people with completely different personalities got intertwined in such a way. What kickstarted this whole thing? Nadia presents a very clear explanation of this when she realises the first time that she had seen Alan in the deli. The night of her 36th birthday, she was supposed to save Alan’s life, who, in turn, would have saved hers. However, they have a close brush, and Nadia is distracted by a trio of drunk men. This strays the both of them from their intended paths, and hence, a glitch in the programming of the universe surfaces in the form of time loops. It’s like running a program. You identify the bug and remove it. It’s like playing a video game. The player will keep dying and coming back to life. You’ll have to go through the same stages, over and over again, until you find a way through them. To get a better grasp of the idea, you’ll need an open mind in both philosophical and scientific directions. Philosophically, you must have heard of the theory that suggests that everyone’s life is connected to someone else’s and that our actions affect the lives of others. In this sense, Nadia and Alan were, sort of, soul mates. They were supposed to save each other. But when their rendezvous was impeded, the universe decided to rectify the mistake, and ran the day for them, over and over again, until they got it right. In science, this quite closely resembles the idea of quantum entanglement. Without going into unnecessary details, it should suffice to know that the theory entertains the idea of two particles (here, people) in the universe being co-dependent. If one particle is affected by something, the other one will be affected too. So, if Nadia falls into a loop, so does Alan. If she dies, then so does he. And, vice versa. Now, how does a time loop work for the universe? For Nadia and Alan, it is just a repetition of their previous days. But these are not the only two people in the world. They are not the centre of the universe. How do their loops affect other people? Are the events of every loop erased to give way to new loops? Not likely. By the end of the series, this whole loop system appears more like the extended version of their parallel universes. As I mentioned before, the “not crossing” of their paths created a glitch in the plan of the universe. 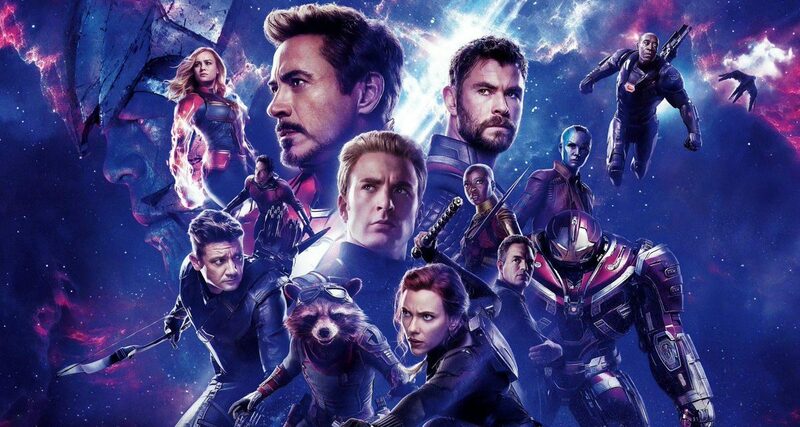 But since they died in one universe, the attempt to fix the bug was made in another timeline. All the time loops that they are experiencing are actually taking place in alternate versions of their lives. But, the farther they stray from their original paths, the more difficult it would become for them to get back to their original timelines. This is enforced from the fact that things start to disappear around them. The energy that the universe has to spend in mending its errors is slowly depleting and over time, repeating the same events in the exact same manner is becoming a difficult feat. For them, it seems like the clocks are rewinding and they aren’t moving forward in time. But the things around them tell a different story. The wilting of flowers and the rotting of fruits is the representation of the time that has passed in their attempts to get back to their lives. The way they’re perceiving time is different from the way the rest of the universe is perceiving it. In the attempt to give a scientific logic to everything, I might have understated the importance and the reasoning behind the disappearance of things. We never get a solid reason for why things have started to vanish, so we can only speculate. While the dissipation of the universe’s energy is a sufficient explanation for it, it is not the only one. 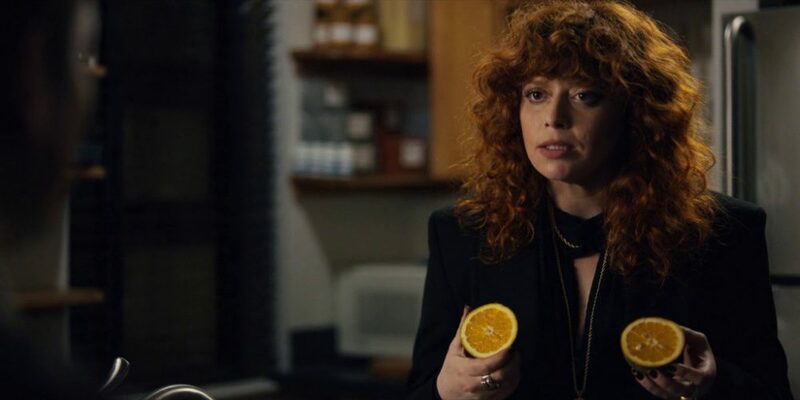 The themes of ‘Russian Doll’ are more saturated with emotional factors, rather than the scientific ones. And a closer look establishes the fact that they indeed have to do with the psychology of its subjects. The simplest explanation is that the universe is focusing their attention on important things. By the end, the only people who remain in Nadia and Alan’s lives are the ones that they truly care about. Every single person in Nadia’s party disappears, except Maxine, who tells her that she can’t go further with her. Not just the people, all the things disappear too. By then, they have discovered the root of their problems and are on their way to fix it. But, according to the universe, that’s not how you fix a bug. The universe wants them to let go of all the materialistic things and emphasises the importance of looking inside themselves, and confront their problem, because only then will they be solved. Another characteristic of the disappearing act is that the universe is strategically removing the issues that have already been dealt with and also the ones that could distract the protagonists from their intended paths. 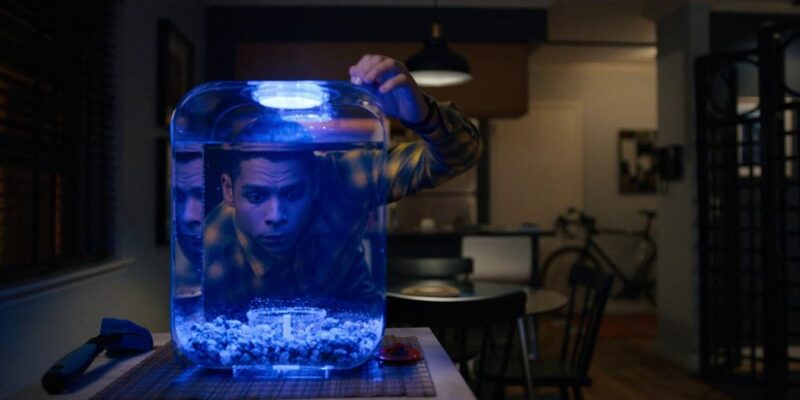 Nadia’s cat and Alan’s fish are the only companions that they truly cherish. The night that she was supposed to save Alan, Nadia was distracted by the disappearance of Oatmeal. So, when she did find her cat, the universe silently removed it from her list of concerns. Alan had focused all his energy on Beatrice. He was vexed by her infidelity and couldn’t let go of it in his initial loops. He held on to the ring that he had bought for her and even told his mother that Bea had said yes to marrying him. So, when he finally started to get over it, when he threw the ring away, the next time, it didn’t reappear. One could say that the disappearance of mirrors was something along the similar line too. Both of their loops started with them staring at themselves in the mirror. As long as they hadn’t identified the bug with their problem, the mirrors remained. And as soon as that problem was solved, every single mirror around them was gone. In a philosophical sense, the mirrors show us what’s on the outside. As Ruth said, they are a medium for “reflection, proof of existence”. The problem on the outside was finding the moment that started it all. The problem on the inside was to come face to face with your inner demons. When the problem on the outside was solved, there was no need for “another pair of eyes” to evaluate their situation. In Greek mythology, there is the story about a Cretan princess named Ariadne. The story has many versions, and each of them acts as an alternate ending to her tale. There are a couple of things that remain constant, though. She was the keeper of a labyrinth that housed a Minotaur to whom sacrifices were made. After much bloodshed in the name of offering to the gods, Theseus decided to kill the Minotaur. It was an impossible task, considering that the labyrinth was a code that no one could have cracked. Not without help, anyway. Ariadne was smitten with Theseus, so she decided to help him by (in some versions) giving him a ball of thread to figure out his way through the maze. With her help, Theseus cracked the code and emerged victoriously. The time loops were a maze for Nadia and Alan, a code that they had to crack if they were to go back to their original lives. And, they couldn’t have done it alone. Not without each other’s help. There was a game that Nadia had designed, which Alan hated because he could never finish it. Nadia tells him, “the trick is to find the labyrinth keeper”. By the end of the penultimate episode, they succeed in facing their issues and pinpoint the problem. This brings them back to their original purpose- saving each other’s life. And this is the last challenge that they have to face alone. As soon as they get back to the way things were supposed to be, they realise that the whole universe has been set back to default, including themselves, though with a twist. Their timelines split and two versions of them appear. There is one version that remembers the loops, and there is another that doesn’t. And both of them get stuck with each other’s opposite version. The Nadia that has reformed through her experiences has to now save the suicidal Alan. The Alan who has made his peace with himself has to now save the life of the damaged Nadia. The last episode follows both of their stories. And in the end, something amazing happens. Successful in their endeavours, both pairs march out and watch the parade, lead by Horse (who is another questionable character), come towards them. As they close the distance, their timelines converge and become one. In the last scene, we are left with one Nadia and one Alan. So, what happened? As Nadia explains, “life is like a box of timelines”. All this time, they were just switching from one timeline to another, in the pursuit of rectifying the glitch. All their attempts were one match less from the box until only the last one remained in the box. This was the one with the Alan and Nadia who remembered their loops. You can tell that by noticing the scarf around Alan’s neck, and the white shirt that Nadia changed into before she left the party. So, what happened to the other Nadia and Alan? I guess, they are still somewhere in some other timeline. There is a clear distinction because when the timelines were split, Alan and Nadia were moving towards, i.e. in the opposite direction of the parade, and in continuing to do so, they would have emerged on the other end of it. However, as soon as the timelines merged, they were moving along, in the same direction, with the parade. 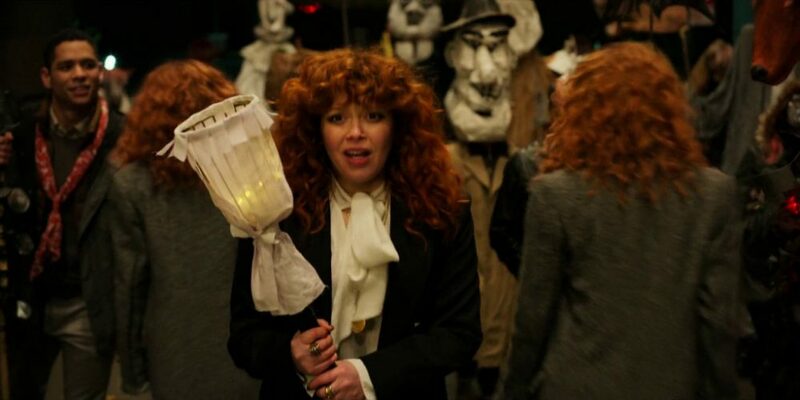 As Nadia walks along with the parade, we see two figures with the same hair and same jacket pass by her. These could’ve been the Nadia’s from other timelines who, perhaps, took a different path. Or, they could simply be the symbol of the facets of her personality that Nadia was leaving behind. At this point, there can only be deductions and speculations. If there’s a second season, (which it probably will be, because the show was supposed to take a three-season arc), it might provide some substantial answer to the questions left behind- one of them being this: how did Nadia recognise Horse even before her loop had started? Had she simply bumped into him before? If Horse’s time was spent largely outside Maxine’s building, then there is a possibility of Nadia having seen him before. However, if the solution is not so simple, then what does it mean for Nadia? Was she already in a loop, but not quite aware of it yet? 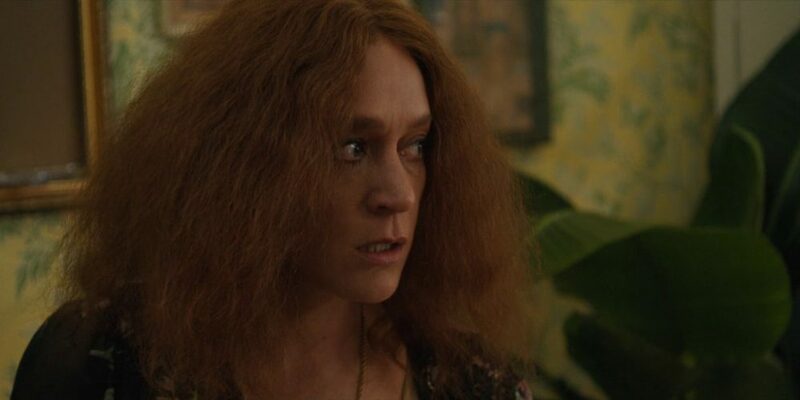 Was Alan’s fate deliberately connected to hers to level the odds for her? If yes, then for how long had she been in the loop? And, more importantly, is she still in one?